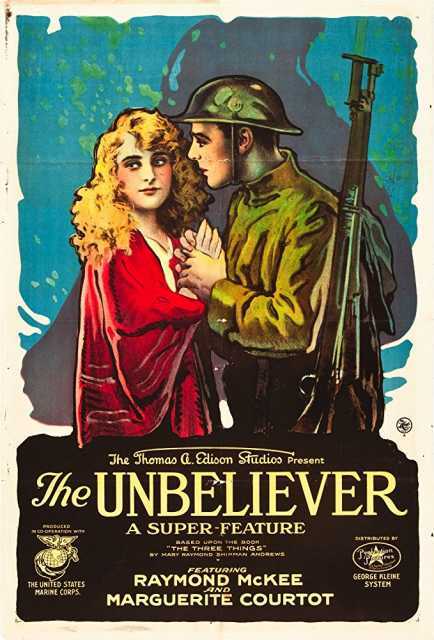 The Unbeliever is a motion picture produced in the year 1918 as a USA production. The Film was directed by Alan Crosland, with Marguerite Courtot, Raymond McKee, , Kate Lester, , in the leading parts. We have currently no synopsis of this picture on file; There are no reviews of The Unbeliever available. Literatur Hinweise - Exhibitor's Trade Review, 26 January 1918, pg 696. - Exhibitor's Trade Review, 23 February 1918, pg 992. - The Motion Picture News, 2 February 1918, pg 710. - The Motion Picture News, 2 March 1918, pg 1320. - The Moving Picture World, 9 February 1918, pg 875. - The Moving Picture World, 2 March 1918, pp 1267-68. - The New York Dramatic Mirror, 16 February 1918, pg 20. - The New York Dramatic Mirror, 23 February 1918, pg 18. - New York Times, 12 February 1918, pg 9. - Variety, 15 February 1918, pg 52. - Variety, 3 May 18, pg 40. - Wid's Film Daily, 28 February 1918, pg 967.